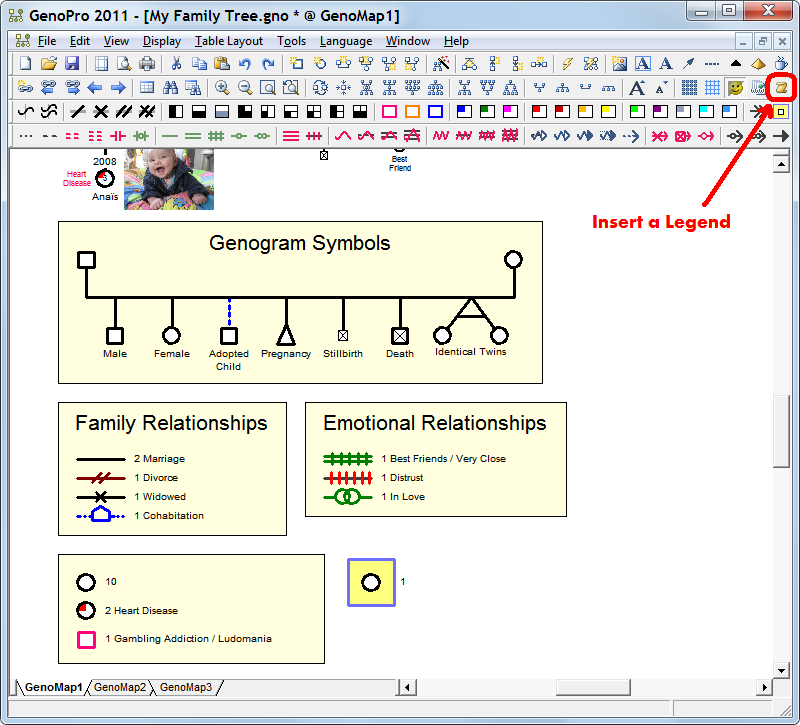 GenoPro has a tool to quickly create a legend of your family tree / genogram. In the main window of GenoPro, press the keyboard key Y and GenoPro will generate a legend based on the symbols you used in your document. Use the mouse to position where you wish to insert the legend in your document. After inserting your legend, you still have to write the text according to your color symbols. GenoPro will count the number of instances of each symbol and will suggest some text (such as a disease or addiction) based on the color, however you are free to replace the text with anything you want. You may also insert pre-defined legends. Simply right-click on the main window and you will see the following menu. Then, you delete the symbols you do not wish to use. Finally, you may also create your legend manually. You copy & paste the symbols you want in your legend, and then mark them as "Label". The "Label" will exclude those symbols from future legends as well as from any HTML report generated by the report generator. Learn more about genogram symbols.